Oprah Winfrey called her stepmother on her birthday and told her she had only a few days to get out of the house she had shared with Oprah's father for over a dozen years. That is just one of the scandalous claims that Barbara Winfrey made about the media mogul in an explosive interview with the Daily Mail that centered on recently received eviction papers that give her until May 29 to leave the home. "I have lost everything," Barbara Winfrey told the UK-based tabloid. 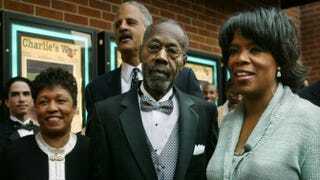 The now-ex-wife of Oprah's father, Vernon Winfrey, says that during her marriage she never signed any of the confidentiality agreements she was asked to. As such, she spared few parting shots against her famous former stepdaughter. Among them, Barbara Winfrey described Oprah's relationship with Stedman Graham as being more about "shared secrets" than love, and her relationship with best friend Gayle King as "bizarre" and "unhealthy." She also claims that on one of her few visits to Oprah's home, the media mogul shouted, "Negroes in the house! Negroes in the house!" to remind her father and his new wife of their "low class." The former Mrs. Winfrey, 66, says Oprah, 60, gave her and then-husband Vernon Winfrey, a house as a wedding gift, but that unbeknowst to her Oprah kept the deed in her name. "My husband once told me that just because someone gives you something does not mean they love you. He was talking about Oprah," she told the Daily Mail. Barbara Winfrey says that the longtime talk show host wasn't very accepting of her during her marriage, and that when the relationship with her father began to fall apart, her ex-husband wanted her "out of the picture"—apparently by taking back the house. "It's not just a house, this is my home. All my memories are here," Barbara Winfrey told the tabloid. "I'm trying to keep it together, but there are some days I just don't understand how I could have made her so angry that she would kick me out on the street and think nothing about it. But that's Oprah—she's judge and jury."